The Palace of Education & Liberal Arts was located on the north side of the garden-court, just inside the main entrance to the Pacific Southwest Exposition. 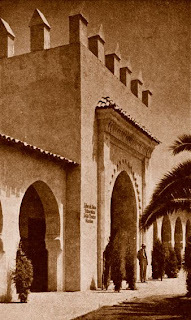 A stately Moorish portal marked the entry to the building, which contained a large exhibit hall, foyer, and the 750-seat Little Theatre. On the north side of the building was placed a 3000-seat stadium, where many athletic events were staged. Inside the building were numerous educational and liberal arts displays; including extensive educational exhibits from the Long Beach public schools, the University of California educational system, and many private colleges in the south-west United States. The Boy Scouts, Camp Fire Girls, Y.M.C.A., and Y.W.C.A. 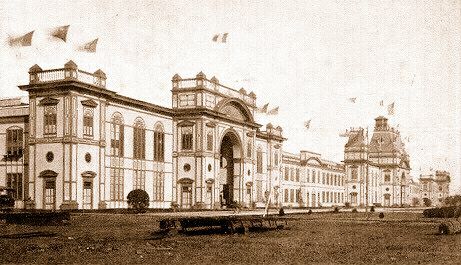 had comprehensive displays; and the building also housed a model print-shop, model home, and several health, vocational, and citizenship exhibits. In the Little Theatre were presented a variety of plays, musical programs, novelty acts, and lectures.